Energy storage systems that are able to cope with fluctuating wind and solar power production are indispensable for the success of the energy transition. So far, however, location-independent and low-cost power-plant-scale storage systems have still been lacking. 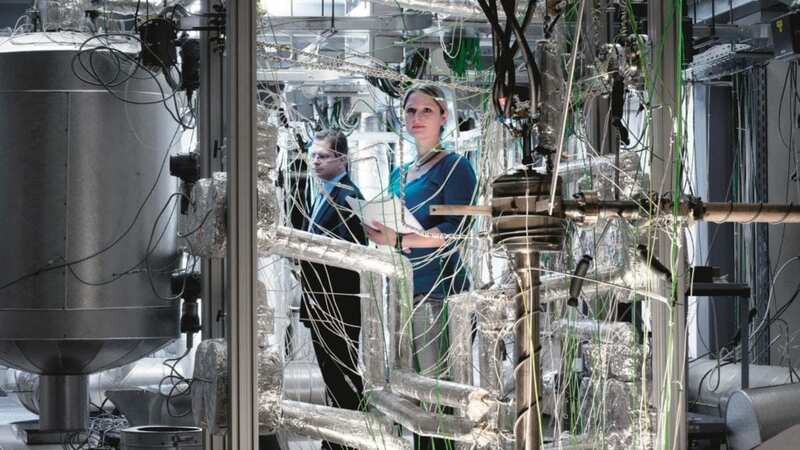 For this reason, KIT, DLR, and Stuttgart University plan the joint construction of the research facility NADINE (National Demonstrator for Isentropic Energy Storage) for the development of low-cost and nearly loss-free energy storage systems. With the help of NADINE, it is planned to study the use of liquid metals for novel thermal storage systems. The exact design of the research facility is presently being developed within the framework of a project of 18 months' duration that started early this year. The design project is funded by the Federal Ministry for Economic Affairs and Energy and the Baden-Württemberg Ministry of Economics. On October 08, 2018 the three research institutions signed an agreement in Stuttgart on the establishment of the research infrastructure in Karlsruhe and Stuttgart. "Big challenges facing the society, such as the energy transition, can only be mastered by joining forces and close cooperation," says Professor Oliver Kraft, KIT Vice-President for Research. "I am very happy that we will be able to contribute our expertise in the area of liquid metal technologies to NADINE. Together with our partners, we will decisively push the development of the urgently required power-plant-scale energy storage systems." The new research collaboration is coordinated by the DLR. Professor Pascale Ehrenfreund, who chairs the DLR Executive Board, says: "The energy transition is one of the pressing challenges facing our society. With the development of storage systems, DLR is working on solutions for one of the key topics in energy research. Efficient storage systems can guarantee reliable energy supply with a constantly increasing proportion of renewable energy sources. Moreover, large thermal storage systems can contribute to reducing CO2 emissions of coal-fired power plants after their reconstruction to heat storage power plants worldwide." The NADINE research infrastructure will be designed for three typical temperature levels in energy storage systems and converters. In Stuttgart, a low-temperature and a high-temperature laboratory for technologies of up to about 700°C are planned. They will be used for studying innovative concepts of Carnot batteries. "By a smart combination of heat pumps, heat and cold storage systems, and heat engines, we cannot only store electrical energy, but generate additional benefits, such as cooling of computing centers," says Professor André Thess, coordinator of NADINE and Director of the DLR Institute of Engineering Thermodynamics. The module for temperatures beyond 600°C will be built in Karlsruhe. It will be applied to study the use of liquid metals for Carnot batteries and thermal storage devices. "Liquid metals have excellent heat transfer properties and can be used at very high temperatures," says Professor Thomas Wetzel of KIT's Institute of Thermal Process Engineering. "Research into liquid metal technology is presently focusing on the development of promising innovative processes for the highly efficient conversion of heat into electrical energy and fuels, which are excellently suited for the NADINE concept." At the NADINE laboratories, heat sinks and heat sources will be made available via a "heat platform". Here, individual components and complete isentropic energy systems will be studied similar to work in a wind tunnel. Researchers will test how the different storage units have to be designed, which materials are suited, and how the individual components interact in the best possible way.